Bilateral and multilateral development co-operation partners committed USD 3.3 billion of development finance per year over 2013 and 2014 to climate actions in 11 countries of Eastern Europe, the Caucasus and Central Asia (EECCA). Compared to other regions in the world and in terms of gross domestic product (GDP) per capita levels, the commitment to the EECCA countries represented a relatively fair share of development finance for their climate actions. Note: The data above excludes some of the trans-boundary projects accross countries/regions to avoid double counting. While significant amounts of climate-related development finance were committed to the EECCA countries, the scale of finance directed to each country is considerably different. Nevertheless, all the EECCA countries still need scaled-up finance from international and domestic sources to achieve their mitigation and adaptation targets under their INDCs and other policy documents. Nearly half of climate-related development finance in 2013 and 2014 was committed to the energy sector, followed by the agriculture, forestry, and water supply and sanitation sectors. 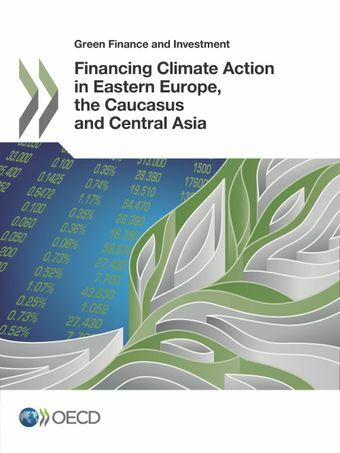 Mitigation finance (81%) outweighs adaptation finance (11%) in the region. These reflect the EECCA countries’ large financial needs for replacing or rehabilitating their aged, inefficient energy-sector infrastructure, amongst others. Climate-related development finance flows as a share of total development finance markedly vary across key sectors in the EECCA region. 69% of development finance for the energy sector is climate-related, while there seems to be a great potential to further mainstream climate-related objectives into development finance for the transport, industry, and agriculture sectors. Note: For more information on the data source and definitions, please see Reader’s Guide of the publication.